Drunk driving accounts for nearly one-third of vehicle-related fatalities in the United States. 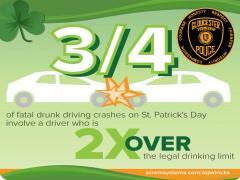 Have a Safe St. Patricks Day... plan ahead and use a ride-share program or designated driver. DON'T DRINK AND DRIVE!